In 2010, immediately after the Norwegian Nobel Committee awarded the Nobel Peace Prize to Chinese dissident Liu Xiaobo, China suspended political talks with Norway and bilateral relations were frozen completely. In December 2016, through a series of goodwill gestures, Norway achieved full normalization of relations with China. Now, Liu Xiaobo’s death in July seems to have finally paved the way for both countries to turn the page and resume free-trade talks. On August 23, China’s Ministry of Commerce revealed that China and Norway held the ninth round of China-Norway Free Trade Agreement (FTA) in Beijing from August 21 to 23. Both sides negotiated on issues including trade in goods and services, investment, intellectual property, environment, competition policy, e-commerce, government procurement and law. The resumption of the bilateral FTA negotiations is an important step to follow through on the consensus reached between the leaders of the two countries and it is of great significance to resume and enhance the bilateral pragmatic cooperation in economy, trade and other areas. We hope that the two sides can take this as an opportunity to move forward the bilateral relations. These are the first round of FTA talks since China suspended political dialogue with Norway in 2010. Yet in April 2017, China and Norway had actually already reached consensus to restart relevant talks on trade and economics. 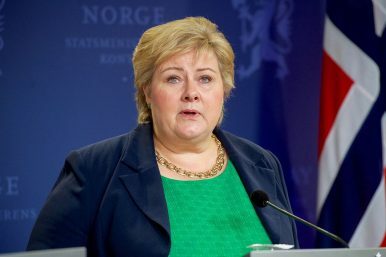 On April 7-10, Norwegian Prime Minister Erna Solberg paid an official visit to China and met Chinese president Xi Jinping in Beijing. During the meeting, Solberg told Xi “how much I appreciated the warm reception we have been given during our visit, and the willingness shown to rebuild and further develop our bilateral relations.” But the bilateral talks didn’t start immediately. It was with great sadness that I received the news of the death of Liu Xiaobo. For several decades, Liu Xiaobo was a prominent voice for human rights and the future development in China. My thoughts at this time go to his wife, Liu Xia, other family members and friends. It seems that Solberg’s refraining from criticism against China appears to have finally paid off. The resumption of the bilateral FTA talks are yet another strong indication that frozen relations have completely thawed. Norway-China Relations 'Unfrozen'Sino-Norwegian Relations, 5 Years After Liu Xiaobo's Nobel Peace PrizeSoul or Salmon? Norway’s Chinese DilemmaWhile China and Germany Sign Trade Deals, Liu Xiaobo’s Widow Allowed to Leave ChinaWith the Liberal West in Decline, Will China Be Given Free Rein?